Soft slouchy hats are probably my favorite fall accessory. 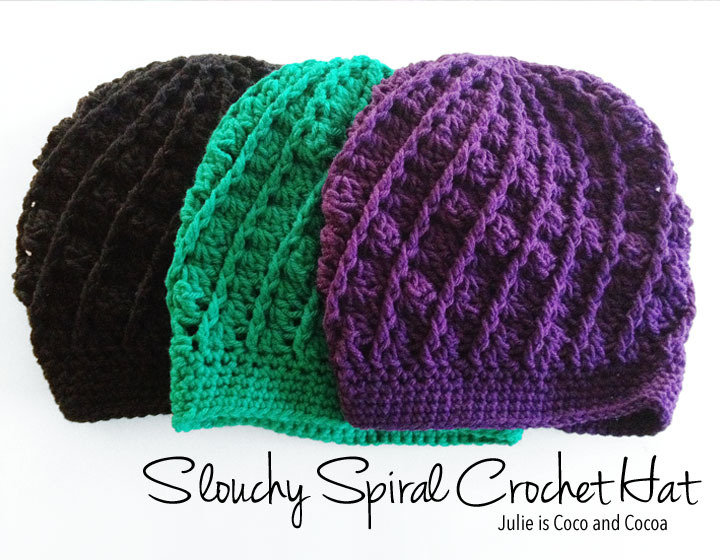 These slouchy spiral crochet hats are always a hit when I do craft shows. And now I’m sharing the pattern with you to make your own! These hats are quick to make up and look flattering on everyone. I recommend making them in a multitude of colors. There seems to be some confusion about the dc’s. You only want to work the dc’s in the first space after the fpdc. Once you work the specified number of dc’s move to the next fpdc. It might help to use a stitch marker to mark the beginning of each round. And if you have any questions about the pattern just leave a comment below and I will answer it! I frequently get customers who come back and tell me how many compliments they get every time they wear this hat. If you think you’re not a hat person, this one might be able to convert you. 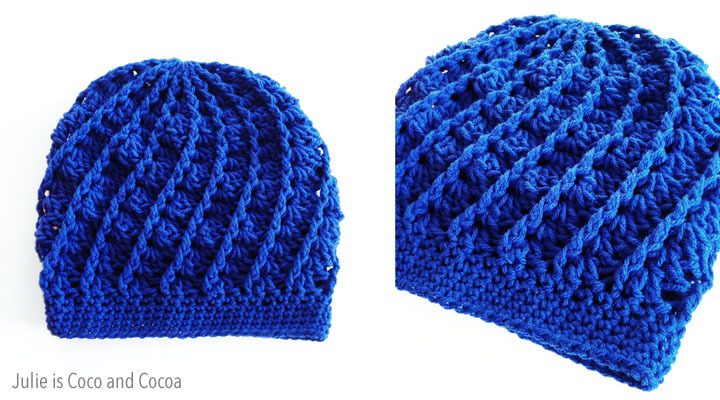 An afternoon of crocheting and you’ll be ready to wear your new Slouchy Spiral Crochet Hat everywhere! Don’t crochet? No problem! Order a finished hat in my shop. Are you joining with a slip stitch at the end of each round, or working in a spiral? I see you are working in a spiral on your video but you already have the first fifteen double crochets done. Do you start with a chain three? Your pattern doesn’ say you do any chain threes. I can understand a spiral on single crochet but it seems like a big jump to go to a spiral on a double crochet. I would like to see an example of how you start the 15 in the magic loop and start the 2nd row that starts your spiral. I just make 15 double crochets inside the magic loop. But you certainly could start with a chain 3 and then make the 15 double crochets inside of the magic loop. When you get back to the first double crochet then you begin working the fpdc. There would be 2 sticks to choose from correct? Which stich do i stich into? I figured it out, after studying the pic. You stitch in the first stich after the fpdc. Our that’s what I did and it turned out great! Yes! Stitch into the first stitch after the fpdc. I’m so glad you’re enjoying the hat! I cannot figure out how to do this pattern. I am lost after the 2nd round and not sure that I am doing this right. It looks a lot looser that the picture shows. Can you help me please? Hi, Anita! If it’s too loose try going down a crochet hook size. And make sure you’re doing the double crochet’s in the first space after the fpdc. Let me know if you have another question! Hi Gloria! This is an adult sized hat, but would also fit teens/older children. Thanks … It’s cute. . going to try it! Hi, Tanya! Make sure you are only putting dc’s in the first space after a fpdc. So do the fpdc, then 3 dc’s, then move to the next fpdc. This is what creates the spiral shape. Mine came out huge and I crochet tight. How wide should this be? I also crochet tight but it came out beautiful. I thought it was going to be too big until I started the brim. I am making another one for a friend. Tanya, I’m so glad you enjoyed the pattern! I hope your friend loves their hat, too. Hi Dawn! Did you switch to the smaller hook size for the brim? Hi Julie! I have just come across this lovely pattern. I would love to know if you used a medium worsted weight in this pattern? 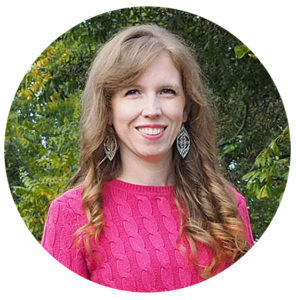 Hi, Kristyn! Yes, I am using a worsted weight yarn. Hello! I’ve been trying to make this hat for a day now and I can’t make it spiral. Are you calling the space behind the fpdc a space, or going into the next one? Hi Jessica! The space directly following the fpdc is the space where the dc’s need to go. Then you move on to the next fpdc, ignoring any other spaces. I am on row 6 of this pattern and it is turning out perfectly, love it! My confusion is with the pattern notes… specifies bpdc and I cannot find that stitch anywhere in the pattern. Just me missing something? Hi Debb! Sorry, no, you’re not missing anything. That was a mistake from a rough draft of the pattern. That stitch isn’t in the final pattern. I hope you’re enjoying the hat. I haven’t been crocheting long so thanks for the replies they answered my questions and validated I was doing things right. Great hat wish me luck!!! 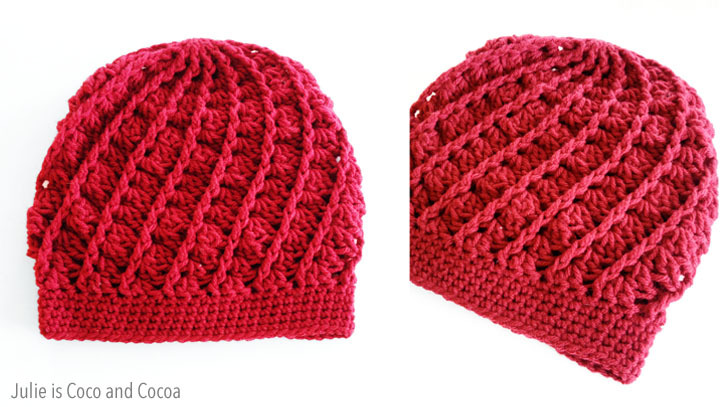 My photo and comments are here: http://deweystreehouse.blogspot.ca/2016/01/scrap-challenge-2-retro-hat.html . Oh boy a beautiful pattern you are very talented…..I must be like the rest and doing something wrong …my first question…..when directed to make a double crochet stitch…are you going into the SPACE or the STITCH…..??? Please could you spell it out for me….very confused…do you have a video on this hat?? Thank you so so so much…sorry I am not grasping the concept..
Fpdc = front post double crochet. 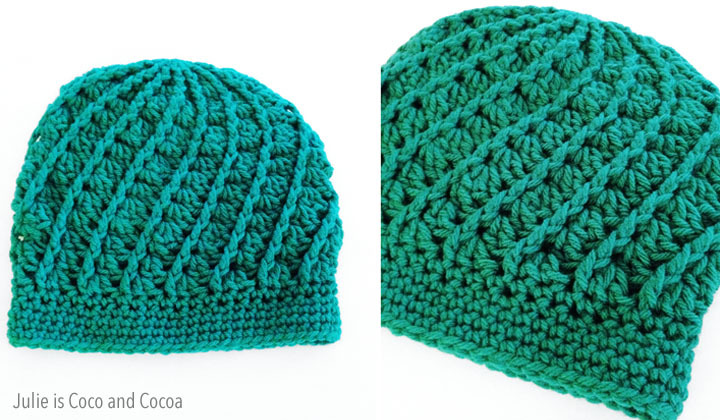 You crochet around the post of the stitch below, instead of into the top of the stitch. Insert the hook from the front, not the back, or you’ll get a bpdc. I’m not Julie, but I can answer the question. Not two into each stitch or space, just into the one immediately folliowng the fpdc. Skip over remaining spaces and make your next fpdc. That’s all. Think bunches of three stitches. Thank you deweysmamasquirrel …..for your answer to my question…BUT!! !…again…just to make sure because I have read two different responses…..
Do the double crochets that I crochet (after the fpdc) go into a STITCH?? Or a SPACE….AS we all know there is a difference. Hello all! Firstly, this is an amazing pattern; I thoroughly enjoyed making it! Thank you, Julie, for sharing it with us! However, I initially got stuck at step three. I kept ending up with way more than 45 stitches when I was nowhere near the end of the step. It took me a few tries, but I finally figured out what I was doing wrong. I was counting the dc stitches as fpdc stitches. (The fpdc stitches are difficult to see in black yarn!) So, once I lined up the fpdc stitches and crocheted the dcs accordingly, the pattern came out perfectly. I hope this helps anyone who is having the same trouble I was! Thank you again for this fabulous pattern, Julie!!! I love my new hat! FIRST YOUR VIDEO IS ABSOLUELY AWESOME…….BUT…I NEED THE WRITTEN PATTERN THAT I ORIGINALLY STARTED THE HAT WITH….I NEED TO KNOW HOW MANY ROWS OF THREE TO MAKE…IT STILL STATES THE PATTERN IS FREE …BUT I CANT DOWNLOAD IT….ALSO I NEED TO GET THE DIRECTIONS FOR THE BAND..
COULD YOU PLEASE TELL ME HOW MANY ROWS TO GO DOWN AND ALSO THE DIRECTIONS FOR THE BAND??? I AM ALMOST FINISHED WITH THE HAT.. I recently came across this pattern, it is beautiful. What are the instructions for the brim, please? That yarn is beautiful, what brand is it? The hats are just lovely!!! Can’t wait to make it! Thank you!! !